The Government deserves congratulations for coming up with a Health Research Strategy. But the current Discussion Document needs a firmer strategic outlook with greater coherence. In this Perspective Blog a simple SWOT analysis is conducted and an alternative Vision Statement is proposed. It makes a lot of sense for a country to have a health research strategy. It should make it easier for prioritising how best to target limited research funding and for the country to play to its strengths in a globalising world. So congratulations to the Government for kicking off this process and for inviting submissions (due by the end of this month) on its Discussion Document (1). Unfortunately the current version of this document has many problematic aspects – and it will need substantial additional work to make it more fit for purpose. This blog tries to get the process on a better track with an initial SWOT analysis and articulating a more appropriate and focused vision. There is relatively high quality research done by internationally well-recognised researchers in NZ. As noted in the Discussion Document, NZ health research articles are above the OECD average in 6 out of 8 health research journal categories. NZ is at the global forefront of big data developments in health – which holds large potential for highly innovative, cost-effective and world-leading research (2). This can help identify benefits beyond health (eg, how diseases impact on employment and incomes (3)) and identify how under-served populations might benefit from changes to healthcare systems. NZ has made good use of ethnicity data around health with much research into ethnic health inequalities. As per the relatively low corruption ratings for NZ (as per Transparency International assessments), the research funding processes seem to be fairly well trusted by researchers. Perhaps because it is a small country, NZ might be relatively better than others at learning from elsewhere in terms of adopting new research methods and potential health interventions to study. As a small country, the ability to take a multiple-government-agency approach to supporting research (although achieving this is variable). Health research is not as well funded as in some OECD countries. Indeed NZ is relatively poor at OECD expenditure on R&D overall – in the lower quartile (4). But recent government increases in research funding in 2016 may have helped somewhat. See below for why further health research might be a particularly good investment. Research investment has not adequately been into the upstream determinants of health, such as political ideologies, societal attitudes and beliefs (including racism), economic systems (banking, financial regulation, taxation, etc) and globalisation. As such when governments sign up to new trade deals, there is little information on what the health impacts (beneficial or adverse) might be. More specifically, research investment has not adequately been into population-wide interventions and how to improve their public acceptability (eg, regulation, health-promoting taxes and mass media campaigns). This is despite the evidence that interventions such as new laws have been some of the biggest drivers for improving health internationally (5-7). Also in some of the topic areas in which University of Otago staff have worked, it is clear that there are preventive interventions that will actually save the country health dollars (in tobacco (8) and dietary salt (9-11)) or achieve net societal benefit (eg, housing interventions (12,13)). The research focus does not adequately address research around intervention implementation and evaluation. For example, there is an effective intervention in the form of HPV vaccine – but there is a lack of research into why coverage of NZ youth is so low compared to Australia and the UK. In the tobacco area the law banning smoking in bars and restaurants in NZ was inadequately evaluated (though some work was done with the fairly limited available funds (14)), and similar research deficits exist for evaluating the point-of-sale display ban and the impact of tobacco tax increases on low-income New Zealanders. The research focus is not adequately on optimising resource use and health economic aspects (eg, compared to ACE-Prevention in Australia (15)). The BODE3 Programme is currently trying to address this gap with forthcoming work on league tables (currently there is just a 12-intervention league table for dietary salt interventions (10)). There has been inadequate research focus on making the NZ health system more robust and viable (in the face of any future economic downturn), and in how it might lower its carbon emissions. The latter is critical for all sectors given the importance of climate change for the planet and for NZ. The research focus is not adequately on achieving health co-benefits around reducing carbon emissions. That is where health interventions such as increasing active transport result in both health gain (reduced cardiovascular disease) and reduced carbon emissions from vehicular transport. Making even more use of big data available to the health sector (2). This is happening but accelerated research investment in this space (including with international partners) seems desirable. Collaborating more with international colleagues – particularly with Australia (given similarities in the two societies) and Pacific Island nations. Three of the latter have constitutional links to NZ and the South Pacific is a region where NZ can relatively cost-effectively help developing countries. Strengthening the relatively strong focus on health inequalities. Strengthening links with Pacific Island countries to assist these nations with health development and to identify lessons for the rest of the world (eg, some of these nations have innovative taxes on sugar-sweetened beverages; and Tokelau has even banned these products). The country’s economy is relatively dependent on export commodity prices and tourism – which can lead to fluctuations in the national income (and therefore research funding). The somewhat ideological nature of NZ politics means that scientific research may not be as well valued as it might be. For example, when politicians implement a health initiative they frequently do not devote resources to adequately evaluate it. (See above for the HPV vaccination and tobacco examples). The NZ population is not that well informed about the value of research and there are anti-intellectual currents in NZ society. The behaviour of attack bloggers who denigrate health researchers is an example (albeit with some of this discourse funded by corporate interests) (16,17). On the plus side is that that the NZ education system does do better than the OECD average for science and mathematics education (18). What might be a better “Vision” for health research in NZ? Make the largest reductions in health loss for the NZ population. Reduce health inequalities in NZ. Make the health system more sustainable (economically viable and in terms of carbon emissions). Contribute to important international health efforts, particularly those in the South Pacific. This would mean that research was especially focused on the largest causes of health loss in NZ eg, as per the GBD 2013 Study: dietary risks, then high body-mass index, then tobacco smoking etc (19). Addressing these major causes with preventive and treatment interventions would generally help reduce health inequalities – but other research domains may matter (eg, the value of further improvements to housing which can have favourable benefit to cost ratios (12,13)). While the Discussion Document mentions issues such as “genetics, epigenetics, nanotechnology and robotics” there is high uncertainty with the value of these domains in the near term future and it is likely that the priority research areas should be around policy and behavioural factors which currently cause the most health loss. Although NZ has produced quality blue sky research in the past – there is probably a stronger case for a small country like NZ to focus on research that ultimately delivers more assured health gain in the short and medium terms. Given NZ’s economic reliance on commodity exports and tourism – there is a need to build in more resilience to cope with any future downturns. Similarly, to help the whole of NZ society achieve its carbon reduction goals – research needs to address how this is best achieved within the health system. Finally, as part of becoming a good international citizen, NZ needs to support international research on key health initiatives. This can include research into globally eradicable diseases and into major risk factors associated with globalisation (eg, global marketing and trade in tobacco, alcohol, and ultra-processed foods). Also research into diseases of poverty is both good for NZ and also good for developing countries. There is also the issue of research into ways NZ can reduce the harm it is currently doing to international health (eg, exporting cigarettes and mutton flaps, threatening countries with legal action when they wish to put health warning labels on hazardous products (20), and being a disproportionately high per capita carbon emitter). Ultimately however, smart policy-makers would simply reduce the need for such research by simply prohibiting these problematic activities. Acknowledgements: The author thanks colleagues who commented on this blog, (though they do not necessarily agree fully with the final content): Prof Tony Blakely, A/Prof George Thomson, and Dr Nevil Pierse. Minister of Science and Innovation and Minister of Health. 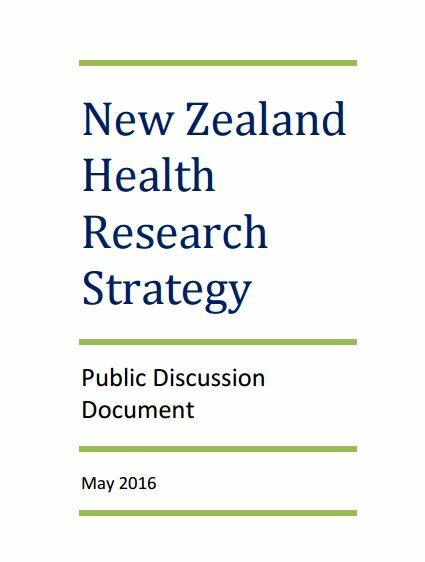 New Zealand Health Research Strategy: Public discussion document. Wellington: Ministry of Health, 2016. http://www.health.govt.nz/publication/new-zealand-health-research-strategy-public-discussion-document. Wilson N, Disney G, Blakely T. NZ’s Smart Use of Big Data: Employment & Income Impacts of Selected Health Conditions. [Blog] Public Health Expert 2016; (14 March). https://blogs.otago.ac.nz/pubhealthexpert/tag/big-data/. Dixon S. The Employment and Income Effects of Eight Chronic and Acute Health Conditions (Treasury Working Paper 15/15). Wellington: NZ Treasury, 2015. http://www.treasury.govt.nz/publications/research-policy/wp/2015/15-15. Moulton AD, Mercer SL, Popovic T, Briss PA, Goodman RA, Thombley ML et al. The scientific basis for law as a public health tool. Am J Public Health. 2009;99(1):17-24. Goodman RA, Moulton A, Matthews G, Shaw F, Kocher P, Mensah G et al. Law and public health at CDC. MMWR supplements. 2006;55(2):29-33. Magnusson R, Patterson D. Role of law in global response to non-communicable diseases. Lancet. 2011;378(9794):859-860. Blakely T, Cobiac LJ, Cleghorn CL, Pearson AL, van der Deen FS, Kvizhinadze G et al. Health, health inequality, and cost impacts of annual increases in tobacco tax: Multistate life table modeling in New Zealand. PLoS Med. 2015;12(7):e1001856. Chapman R, Howden-Chapman P, Viggers H, O’Dea D, Kennedy M. Retrofitting houses with insulation: a cost-benefit analysis of a randomised community trial. J Epidemiol Community Health. 2009;63(4):271-277. Keall MD, Pierse N, Howden-Chapman P, Guria J, Cunningham CW, Baker MG. Cost-benefit analysis of fall injuries prevented by a programme of home modifications: a cluster randomised controlled trial. Inj Prev. 2016. Edwards R, Thomson G, Wilson N, Waa A, Bullen C, O’Dea D et al. After the smoke has cleared: evaluation of the impact of a new national smoke-free law in New Zealand. Tob Control. 2008;17(1):e2. Vos T, Carter R, Barendregt J, al. e. Assessing cost-effectiveness in prevention (ACE-Prevention): Final report: University of Queensland and Deakin University, 2010. Hager N. Dirty politics. Nelson: Craig Potton Publishing; 2014. Dudding A. ‘PC’ targets hit back. Sunday Star Times 2016;(19 June): A9. Reid N. Liquor labelling debate heats up. Sunday Star Times 2011;(24 April). http://www.stuff.co.nz/sunday-star-times/latest-edition/4921402/Liquor-labelling-debate-heats-up.